This spring the Stratford Festival will present James Reaney’s adaptation of Lewis Carroll’s Alice Through the Looking-Glass at the Avon Theatre in Stratford, Ontario. Alice will be directed by Jillian Keiley, an award-winning director from St. John’s, Newfoundland. Cast members include Trish Lindström as Alice, Cynthia Dale as the Red Queen, Dion Johnstone as the White King, Tom McCamus as the March Hare, and Brian Tree as Humpty Dumpty. To purchase tickets, call 1-800-567-1600 or order online here. 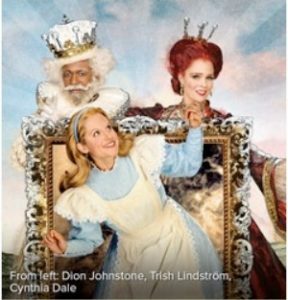 Dion Johnstone, Trish Lindstrom, and Cynthia Dale in Alice Through the Looking-Glass, May 31- October 12, 2014 in Stratford, Ontario. —From the Foreword to Lewis Carroll’s Alice Through the Looking-Glass: adapted for the stage by James Reaney, pages 12-14, The Porcupine’s Quill, 1994. James Reaney’s adaptation of Alice Through the Looking-Glass premiered at the Stratford Festival in 1994 and was revived in 1996. 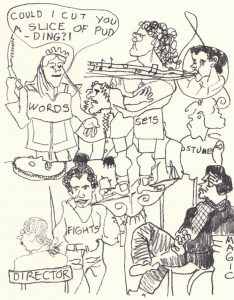 The play is available in Reaney Days in the West Room: Plays of James Reaney, David Ferry, ed., Playwrights Canada Press, 2008. Illustration by James Reaney, 1994. “I am very proud to have helped with such a delightful show with designers, magician, composer, actors, director, and backstage staff who have seen to it that Carroll’s magic text and verbal wit is made all the more powerful.” James Reaney, Foreword, 1994, page 15.